And here are the cubes for March. Sorry for the delay. Given the delay, one of these cubes is rather apropos. Um... what's that first one? Cheese grater? Apartment building? Xtra long USB plug? Don't tell me anything that will make me slap my head as it already hurts from doing taxes. The cubes don't come with a key to tell you what each face means. Go with your interpretation of the image. For me, it looks like one of those parking tickets you feed the gate before you leave a paid lot. Or maybe it is a scantron (age alert!) that you are feeding into the machine. Scantrons? OMG! I haven't thought of those in... a few years. I've got some photos I need to sort for this set of cubes. I was looking at my parking ticket and thinking I should take a photo of it for this challenge but I forgot. I'll see how I work my way around it. March is three-quarters done and I am still stumped. Hoping by saying I am "still stumped" will turn things around. I have this weird superstition: if you say something IS, then the opposite happens. Like... "gee, there isn't any traffic today." Six seconds later, I'll be stuck in traffic. So, "I'm stumped and will NEVER come up with an answer." Haha I have the same superstition but try to stop myself from saying, or thinking, "the roads are quiet today" cos I'm convinced that means I'll hit traffic. If I don't form the thought completely I can stop it from happening. If I don't form the thought completely I can stop it from happening. Exactly!! I've been known to hit Don (gently ) if he starts to voice such a thing! Getting enough sleep is one of (my) life's perpetual struggles. Why? I had a late evening. Would wouldn't think that given the event runs from 8PM to 11PM. Except that I didn't do that event. I had actually stopped into the shop around 10:20PM to pick up an order that had come in. 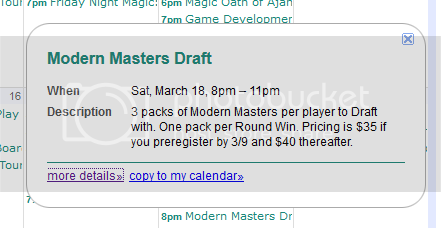 They were starting a LATE night draft at 10:30PM and they were supposedly 1 short. So I got talking into paying for a late night draft. (I went 0-2 with 1 bye if anyone was interested.) Needless to say, it was 2AM when I finally got home. But it is a Friday night and Saturday is for sleeping in right? Ohhh .... you got a WHAMMY. Why? I needed to get up early because we were supposed to meet folks in San Francisco for lunch. It was a new place and the lines are supposed to be long. How do you beat a long line? By getting there early. Except we were too early. 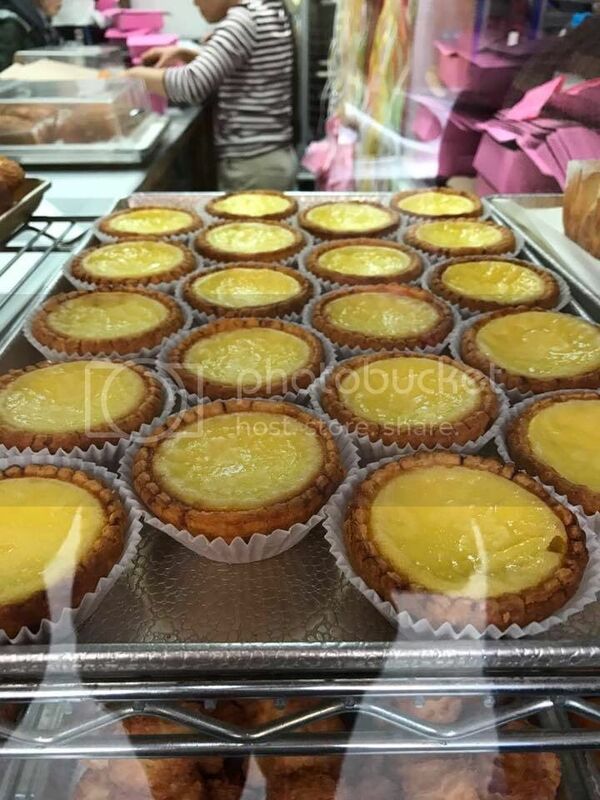 And to kill time, we went to Golden Gate Bakery to pick up some egg tarts. MMmmm ... freshly baked egg tarts. 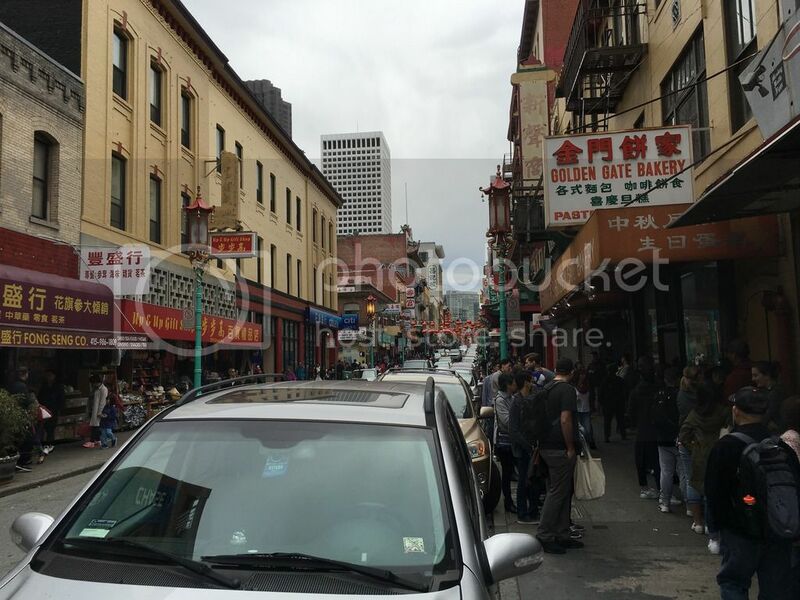 Later on, we ended up walking past the Golden Gate Bakery and saw this line. Yup. The ticket to getting yummy yummy egg tarts to be early. Or better yet, have someone else be early to get it for you. Heck the ticket to get anything in San Francisco is be early. Try finding a parking spot late in the afternoon. Sheesh. But the day in the City by the Bay was not just food. Although it seems that food and drinks played a major role in where we went. While going around, I happened to see this sculpture by the Hyatt (?) hotel. It was made back in the early 70s. I had to pause and admire the sculpture. After all, it supposedly have 72 iconic San Francisco sites cast into it. I may have to go back and take a few more shots of it or try a pano shot to capture more of it. I was in a rush as I had to catch up with the rest of the group so I just snapped a quick shot. While I was walking away, it struck me that when it is all said and done, we only view things through a keyhole. Why? In a large picturesque city, any of the sites we stop to view is just a small part of the overall city. We get tunnel vision and develop a laser focus upon that 1 thing. 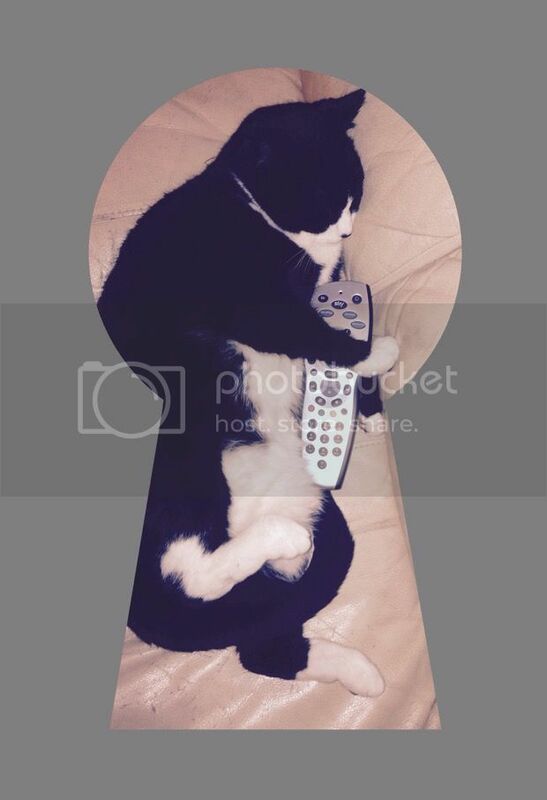 Which is pretty much like looking through a keyhole. You have a very limited field of view and you pretty much have to focus on that one thing. Which is the nice thing about this sculpture. It sums up many of the iconic sites in San Francisco. Now it seems I need to go back and get better photos of this sculpture and identify the sites so I can see how bad my tunnel vision is. Because I'm sure I am very far off of seeing all 72 iconic sites as defined back in the early 70s. Oh, and, finally finally... love your post! The first part was an event the night before that kept me from my sleep. If you haven't gotten into cradboard crack, I mean Magic the Gathering, it doesn't mean much for you. 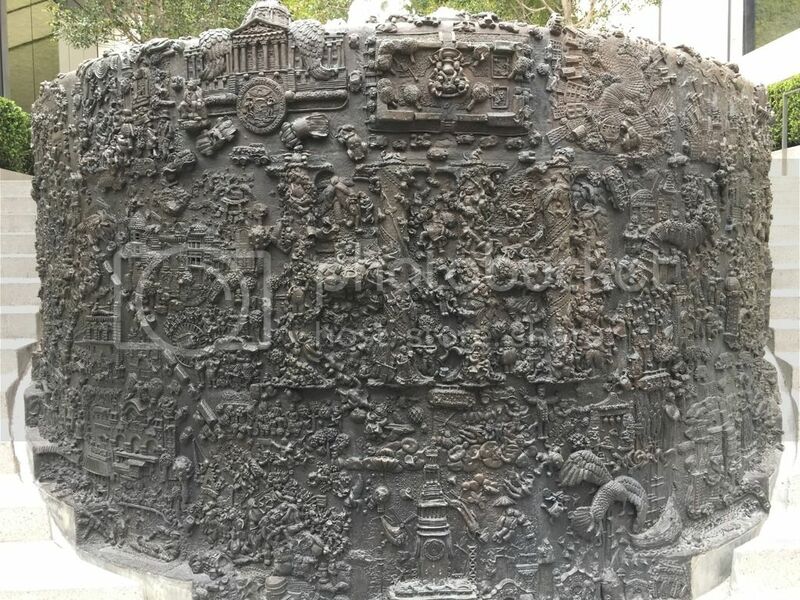 The sculpture is around 350 Post St in Union Square. At least that is what the photos app on my iPhone claims. There may have been a key for itas part of the plaque, but I didn't grabs picture of it. Glad you enjoyed it. I was trying to find things for the cubes and non-literal interpretations at that.